Where am I? 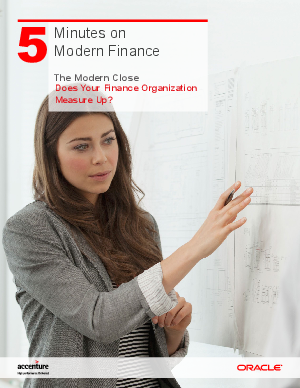 › Home > White Papers > Oracle > 5 Minutes on Modern Finance: The Modern Close, Does Your Finance Organization Measure Up? Although the close process may not rank at the top of C-suite priorities, smart finance executives know that a well-designed, technology-enabled close has become a critical best practice by which modern CFOs and their teams are measured. The faster you can close the books and deliver right-time insights to key decision makers, the more strategic your finance organization can be to the business.